Photograph IWM Q 9534, linked from The Wilfred Owen Multimedia Digital Archive. This photo is "one of the most famous photographs of the war" according to the well-known battlefield-book authors Tonie and Valmai Holt. The legendary Western Front guide book writer Mrs. Rose E. B. Coombs writes that it is “one of the most impressive photographs in the Imperial War Museum collection”. 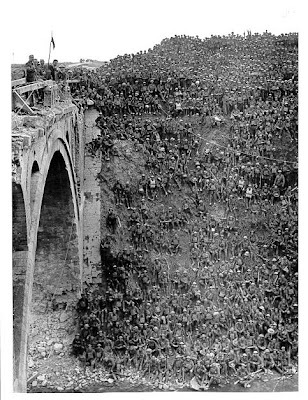 At the photo Brigadier-General J. C. Campbell is addressing hundreds of British soldiers on the slope of the St.-Quentin canal beside the Riqueval Bridge the 2nd October 1918. The Riqueval Bridge was captured almost intact by the British on the 29th September 1918. In this battle the famous British war-poet Wilfred Owen (1893-1918) crossed the canal a little way south of the bridge. 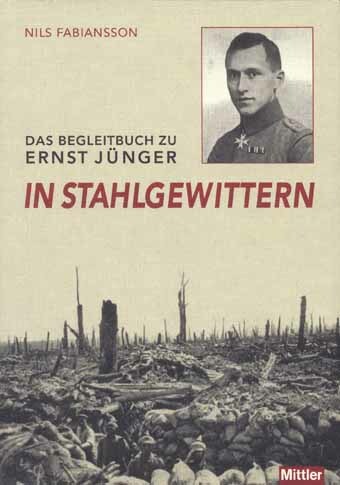 Ernst Jünger does not mention the Riqueval Bridge in his account In Stahlgewittern, although the "Roman road", which passed the bridge, is mentioned as the left (south) limit of his company sector in May-June 1917.